Mediators from southern Sudan arrived at the border with Congo on Friday for talks with a rebel group that has led a brutal 19-year insurgency in Uganda. The 126-member delegation includes local officials and relatives of shadowy rebel leader Joseph Kony, who is under indictment by the International Criminal Court. Fighters in his Lord's Resistance Army are known for abducting thousands of children, forcing them to become fighters, servants or concubines. The group has killed thousands of civilians and forced more than 1 million to flee. Its political agenda is unclear, although Kony has called for Uganda to be governed according to the Bible's Ten Commandments. "We have to be patient. This is an ugly war with lots of ruthlessness, but this is our best opportunity ever for peace," said Mario Giro, a member of the mediation team. It was not clear whether Kony would come out of hiding for the talks. Uganda's president, Yoweri Museveni, has offered to protect him if the LRA agrees to give up its weapons. 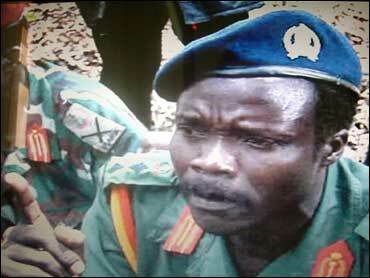 The LRA, however, has demanded that its fighters be incorporated into the national army. Uganda's Interior Affairs Minister, Ruhakana Rugunda, said the International Criminal Court is "impotent" and that if peace talks go well the country will deal with Kony through "traditional and cultural mechanisms." A human rights group Friday denounced calls for amnesty. "International law rejects impunity for serious crimes, such as genocide, war crimes, crimes against humanity and torture," the New York-based Human Rights Watch said. The negotiations are an extension of talks being held under the mediation of Riek Machar, vice president of southern Sudan's autonomous government. Southern Sudan is pushing to resolve the insurgency because it wants to secure its territory as it prepares for reconstruction after its own 21-year civil war. The LRA set up rear bases in Sudan and Congo, and its fighters have been accused of attacking civilians and threatening stability in those countries. The rebel group is made up of the remnants of a rebellion that began after Museveni took power in 1986.